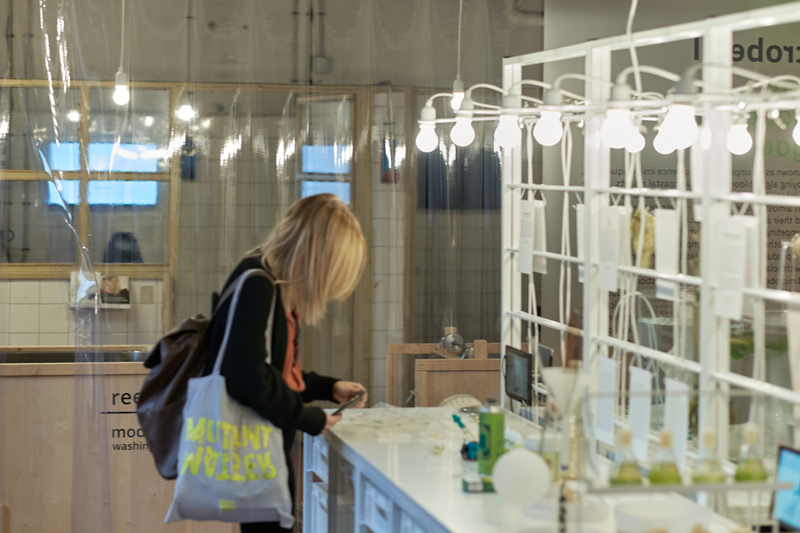 The office mareike gast is an office for industrial design with a special focus on new materials and technologies. I firmly believe that the material- and technology strategy should play a key role from the very beginning when developing innovative and fascinating products. 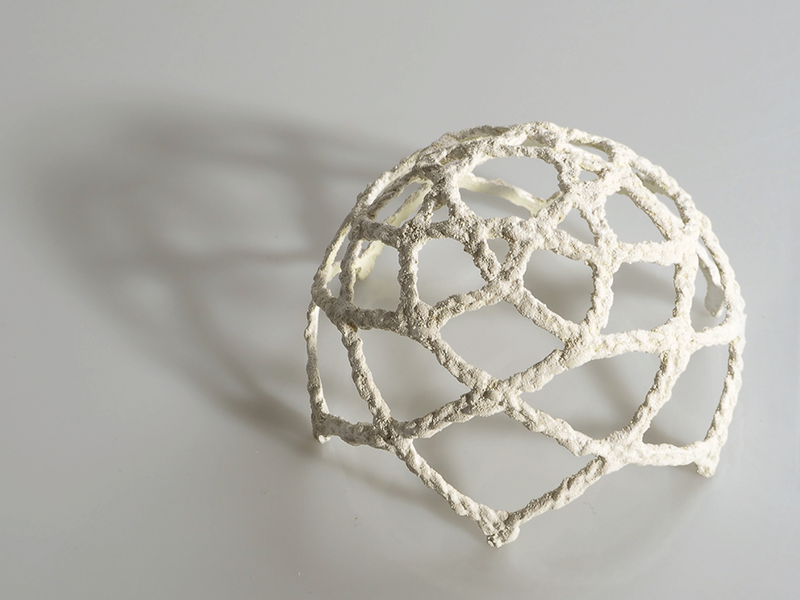 It is my aim to create a bridge between scientific research and development and industrial design. All text, images and graphics are subject to copyright law and only used for the display of this website. They must not be copied or altered without prior written consent. All content on this website is for general informational purpose only. We have taken the greatest possible care in reviewing this content but assume no responsibility for the correctness, completeness or currency of the information provided. In spite of diligent reviews we disclaim any responsibility for the contents of linked sites. The parties operating linked third-party websites are exclusively responsible for the contents on those sites. browser used and, if applicable, the operating system of your device as well as the name of your access provider. The legal framework for data protection may be found in the German Federal Data Protection Act (Article 6 (1) lit. f DSGVO) and the Telemedia Act (TMG). My legitimate interest follows from the purposes listed above for the collection of data. Under no circumstances do I use the collected data for the purpose of drawing conclusions about your person. If you have any questions, I offer you the possibility to contact me by e-mail. If you make use of it, the personal data transmitted by you will be stored automatically. The storage serves solely for purposes of processing or contacting you. Data processing for the purpose of contacting me is carried out in accordance with Article 6 (1) lit. a DSGVO on the basis of your voluntary consent. The personal data collected by me will be automatically deleted after completion of your request. and this is legally permissible and necessary for the execution of contractual relationships with you according to Article 6 (1) lit. b DSGVO. to complain to a supervisory authority in accordance with Article 77 DSGVO. Generally, you can contact the supervisory authority of your usual place of residence or workplace or of my company headquarters. If your personal data are processed on the basis of legitimate interests according to Article 6 (1) lit. f DSGVO, you have the right, according to Article 21 DSGVO, to object to the processing of your personal data if there are reasons for doing so which arise from your particular situation or if the objection is directed against direct advertising. In the latter case, you have a general right of objection, which is implemented by me without stating a particular situation. I make use of suitable technical and organizational security measures to protect your data against accidental or intentional manipulation, partial or complete loss, destruction or against unauthorized access by third parties. My security measures are continuously improved in line with technological developments. Mareike Gast studied at Central Saint Martins College of Art and Design and graduated from the Design Academy Eindhoven in Industrial Design in 2005. 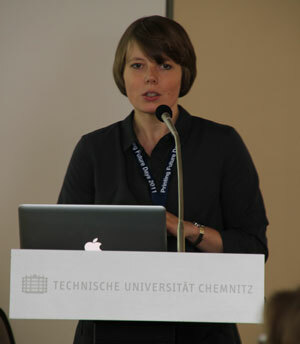 From 2006 to 2010 she worked as a freelancer inter alia for Nicola Stattmann (Frankfurt), responsible for many product developments. Since 2011 she runs her own office with an emphasis on new materials and technologies. Since September 2016 she is a Professor for Industrial Design at the Burg Giebichenstein University of Art and Design Halle. In addition to her work in product development, reasearch and teaching Mareike regularly writes for different magazines about material research. 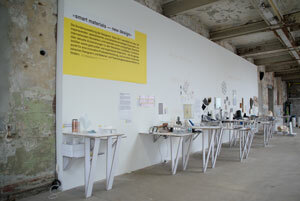 In 2013 her book ‚smart technology – new design‘ was published accompanying the exhibition and conference of the same name in Leipzig, which Mareike has curated several times. 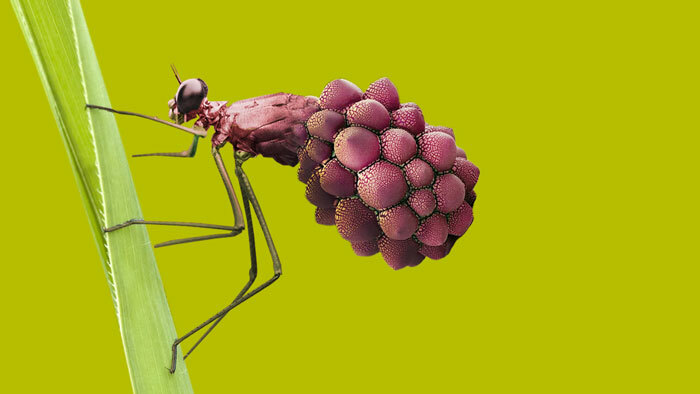 The variations of the artificial species combine the unique aesthetics of insects with the technological potentials of flexible electronics into fascinating demonstrators. The manifold possibilities become tangible. Papilio Lunae and Musca Noctis are the beginning of an interdisciplinary 'insect research' with the aim to max out the possibilities of flexible elctronics and to communicate its diversity. 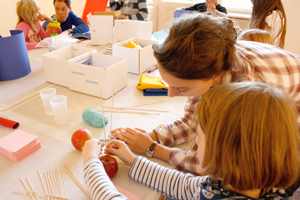 The project is publicly funded by the German Federal Ministry of Education and Research (BMBF) as a Zwanzig20 Forum / Partnerschaft für Innovationen. Three different material- and technology concepts show alternative possibilities for an innovative input device for large appliances. For best usability, high-quality and longevity as well as the possibility to customize the input device various display and touch technologies were compared. Furthermore technological concepts in order to blind-control capacitive touch displays were identified and developed further. The overall concept of operations and user experience design was developed by ma ma Interactive System Design. This year's special exhibition with more then hundred inspiring, specialised and often unique exhibits from international research institutes, companies and designers gives an overview on current technological developments from the topics Manifold Foldings, Digital Fabricators and 3D Spraying – as a starting point for an innovative product development and in order to stimulate the exchange between designers and material and technology scientists. 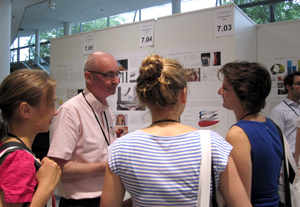 The exhibition was hosted by Leipziger Messe GmbH, supported by an interdisciplinary student team of HTWK Leipzig and financed by Leipziger Stiftung für Innovation und Technologietransfer. Polytronics – printed organic electronics is a forward-looking field of research and an advanced cutting edge technology. It represents an entire new way of electronics. 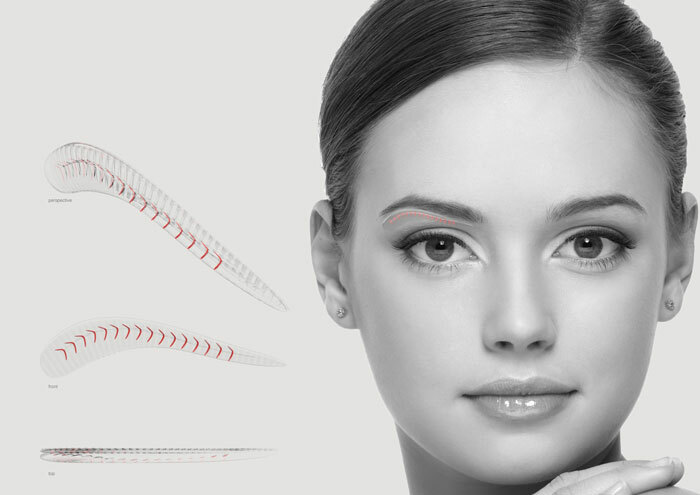 It ultimately results in qualities such as ultra-thin, flexible, foldable and allows new interaction principles. So far mass production is still in its infancy. This study aims to identify and highlight the immanent potentials of the technology and its materials for product interaction. In the area of technology research the study offers the opportunity to focus on human centered and market related questions in order to develop answers accordingly. Through the flexibility of the substrates and printed strain gauges combined with a a numeric display a letter scales is created..
As the entire alarm clock becomes a snooze-switch – the whole product turns into one interface to interact with. The good old-fashioned calculator – reinterpreted. A two-dimensonal paper-like substrate turns into a 2½-dimensional calculator forming a haptic numeric pad with a tactile response. A big wall clock – made of ultra thin flexible tiles – turns into an unobtrusive and playful dedicated display. Due to the inherent properties of the technology and the materials used, hand-shaped electronics becomes possible. Through folding and bending delicate lighting comes into existence, based on traditional shapes yet reinterpreted. Ultimately the lamp becomes sculptured lighting. 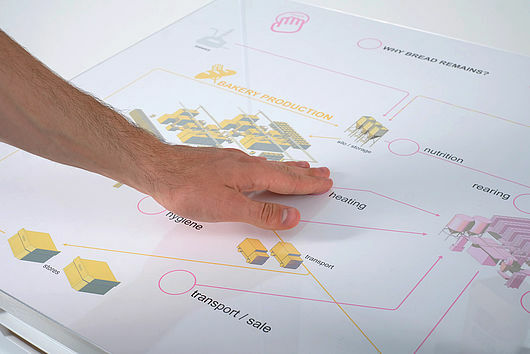 Input and output – a touch screen and a display, the basic components of interaction develop into lightweight, flexible and economic devices through the use of printed organic electronics. After the successfull conference and special exhibition at DO/Industry 2011 we are going into a second round. This year's topics were natureTEC, ENERGetic and inMOTION: Growing mobility and an increase in energy demands with diminishing resources mean that designers are facing stirring challenges. inMOTION // In a world that is always moving faster, the demand for mobility constantly increases. But how much mobility does a human being really need? Where does our constant need for mobility throughout the world come from? And how can we assuage it today, tomorrow and the day after tomorrow? inMOTION takes a look at new technological possibilities for the design of intelligent systems of mobile data, mobile areas and environments and products meant for a mobile society. ENERGetic // Where does our energy come from? And why do we need it? What does real alternative production and clean use of energy look like? In the future, will we remain dependent on determined power networks or will we be able to supply ourselves? 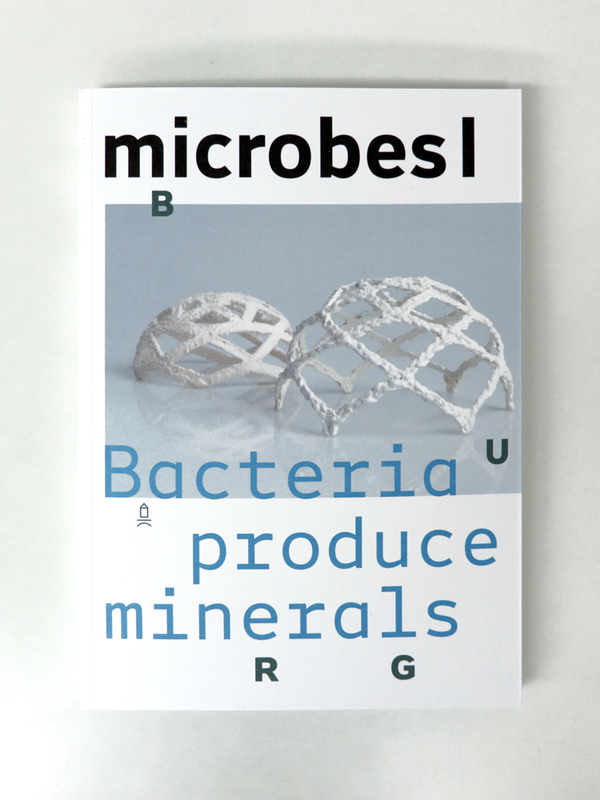 ENERGetic spotlights self-sufficient production processes and products as well as their utilisation, explores design possibilities, looks into new approaches instead of energy sources for the masses, and discusses the potential of new energy sources such as algae. 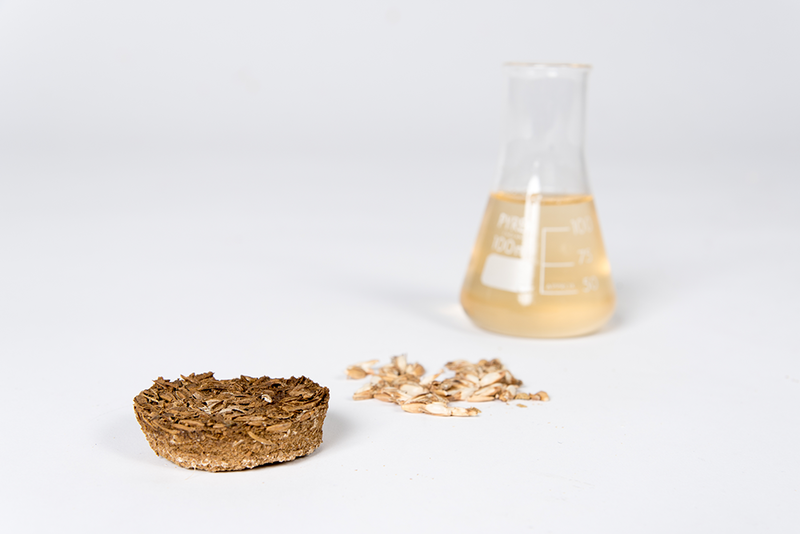 natureTEC // We make bread with yeast-bacteria and wash our clothes with enzymes, but nature has so much more to offer. What would products created by microbes, glowing through movement or self-producing their energy, look like? What happens when natural movements and transformations serve as a manufacturing process and a means of design? natureTEC examines nature carefully as a provider, model and producer. Focus will be made on themes such as evolutionary and bionic principles, renewable resources, self-production, self-repair and self-destruction. The historic Textilmanufaktur is moving into a new building - back to its old site and origin: the design school Burg Giebichenstein. For the fassade design and a sun shield the idea evolved to create a custom-made textile. This would not only turn the inside of the building outside and give the Textilmanufaktur a unique and particular appearance but also shift the Textilmanufaktur‘s tradition of handmade textile art into forward-looking technical textiles, which however retain their artistic quality. 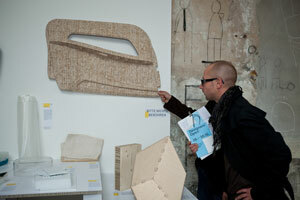 In order to make this possible I developed a concept for suitable materials and technologies. The research focussed firstly on technical aspects such as UV-, weather, tear- and fire resistance. The second practical parameter was the feasibility despite small quantities and customisation. The third – of course – the broad design-ability transferred from other textile industries. The results reach from PTFE and coloured glass fibres to fire-resistant and tensile PES yarns in combination with 3D-knitting, multi-axial technology, leno weave, warp knitting and hand weaving. 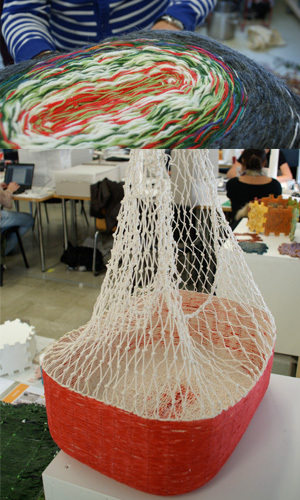 Textile design and textile art students developed in a week‘s workshop first ideas based on this research. In a competition 5 designs were selected. The realisation of a prototype is the next step. Designers' Open 2011, DO/Industry from Jan Hartmann on Vimeo. For the renowned manufacturer of medical products Bauerfeind a long-time development led to the innovative insole ErgoPad weightflex. Using complex tooling orthotic cores are manufactured with variable stiffness thanks to the implemented weightflex-X. 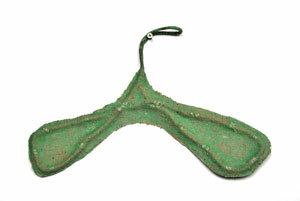 Therefore the insoles are adaptable to different body weights and shoes with higher heels. The two-component injection moulding with specially modified materials allows a high range of variations for individual foot conditions despite the automation of the manufacturing process. Visually the product communicates its high quality and complex functionality and thereby appeals to not only the orthopaedic technician but also the enduser. The insoles evolve from medical supplies to a elegant premium must-have. The development process was supported creatively and intensely from the first idea to the serial production. the new structure that appears through the broken shelves gives space to differently sized books and allow them to lean. one element provides a place to sit and read inside the shelves. the shelves are constructed like a sandwich, made of two steel frames consisting of t-profiles and grooved black mdf inbetween. 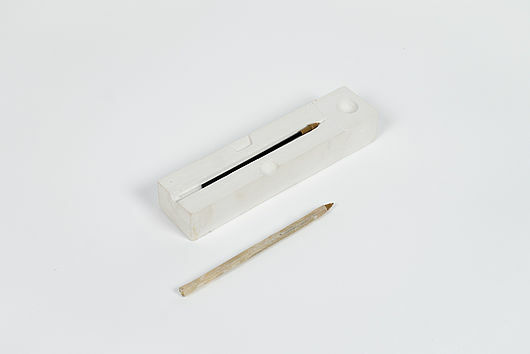 the construction allows a very easy assembly and the transportation as a flatpack, which reduces the size to a third. in areas, where no electricity is available, communication over long distances is by far more difficult. especially in refugee camps reliable information is difficult to obtain. for such a context I have designed the refugee radio. it is energy-atarkic since it is run by the radio-waves themselves. the necessary technology is cheap, very reliable and relatively environmentally friendly. I gave consideration to the adaptability to different situation and the cultural context: the radio works in its paper packaging, but can be adpated in the long run by replacing the cover with different materials. who does not like to sit near the radiator on cold winter days? this radiator is the updated version of a tile stove which is possible due to modern low temperatur heatings. it is especcialy useful in long cold school corridors during break time. a cabinet made of larch with an overhanging compartment. this does not only make the cabinet special but also useful in order to hide away bulky stuff. the cabinet can be disassembled for transportation easily. Hardly any material creates such a great ambivalence in us as plastic. On the one hand, it is perceived as cheap, short-lived and environmentally unfriendly - and it is used that way. 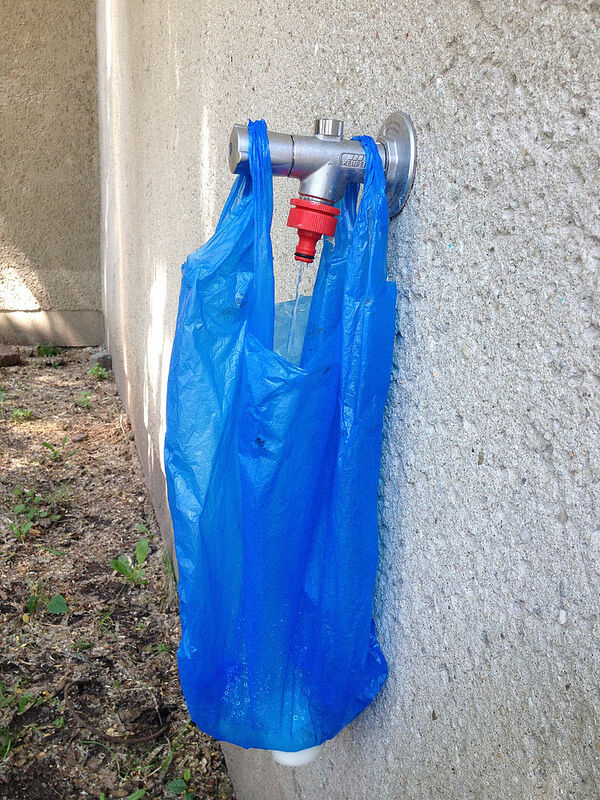 On the other hand, plastics and their processing methods have decidedly shaped our consumer goods and thus our everyday life, because plastic is an extremely multifaceted, malleable and at the same time affordable material. At the same time, plastic is future-oriented: it is potentially produced from alternative raw materials, is in principle very easy to recycle and, with growing importance, is replacing rare materials in order to produce functional, for example, electronic components. 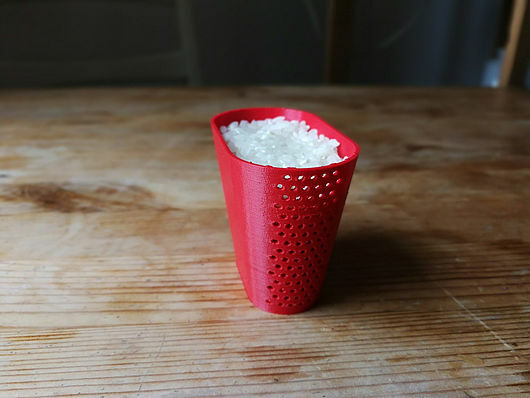 In this project we devoted ourselves to the super normals, the simple, everyday, almost invisible commodities made of plastic, examined their necessity - also from a cultural perspective - and developed a next generation. A key aspect lies in the recyclability and use and design of material cycles. During the semester, we went through the entire design and development process right up to mass production in injection moulding from recycled plastics. For this we used the Precious Plastic Machines by Dave Hakkens. 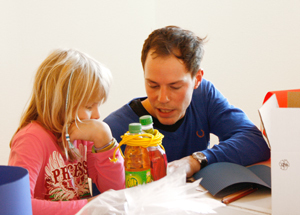 A project at the Burg Giebichenstein University of Art and Design Halle supported by Anna Hoffmann and Karl Schikora. In cooperation with Conrad Dorer, German Environment Agency. Although the rice from the supermarkets is flawless and packaged, rice grains are washed before preparation. This hygienic procedure from ancient times is still a spiritual act of purification. But there is no suitable utensil for washing and the water consumption is correspondingly high. 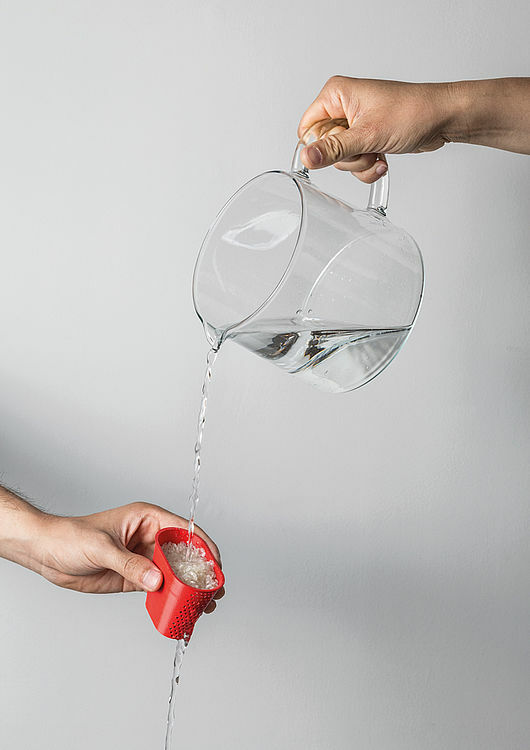 In order to give new life to the original tradition, the Nicer Ricer finds a contemporary approach: the classic measuring cup, as known from every rice cooker, also serves as a tool for washing rice. 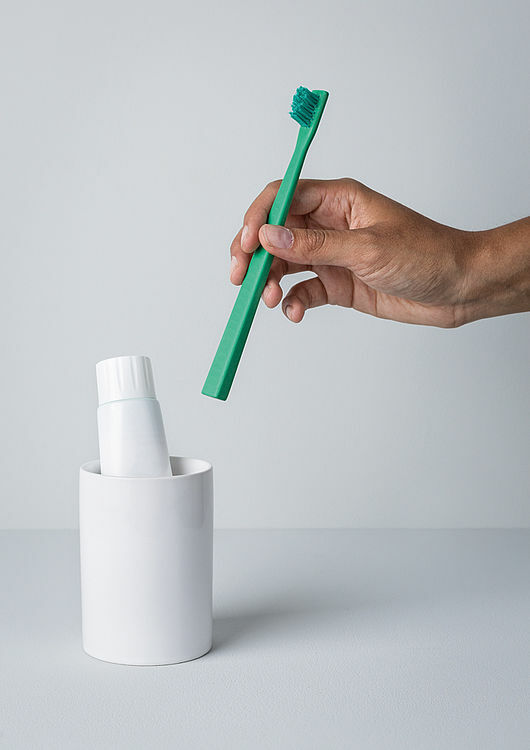 The handle and bristles of this toothbrush consist of one and the same material: polyamide. However, normal toothbrushes are made out of three different plastics and are therefore not recyclable. A toothbrush should be renewed not later than every three months. 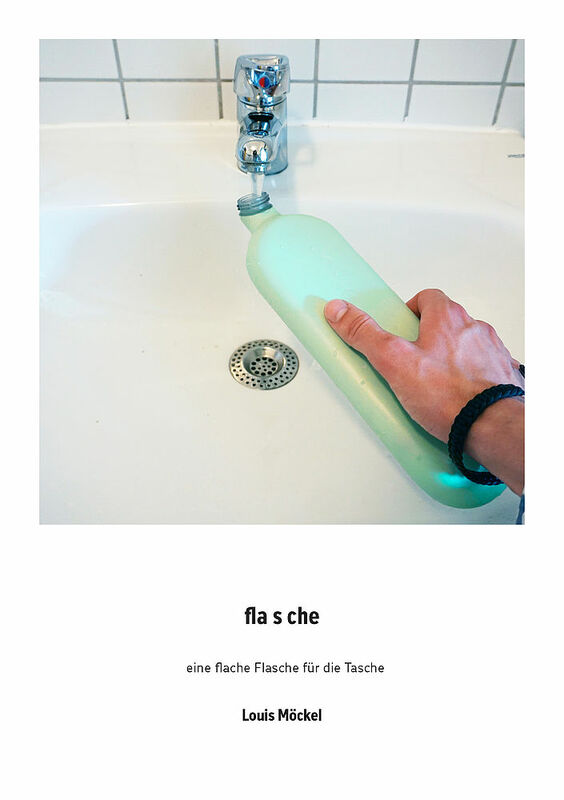 As the toothbrush scho is a monomaterial product, it enables the consumer to recycle it easily. 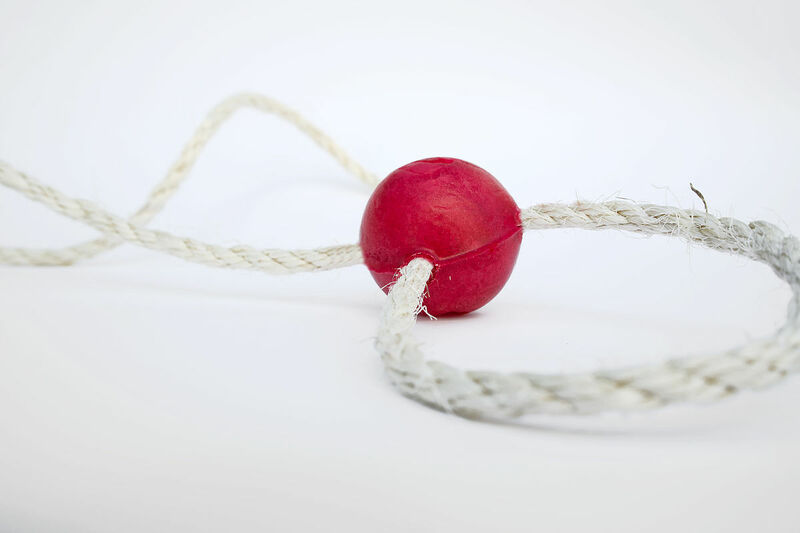 It is about creating a circular economy, which focuses on reusing the originated waste. 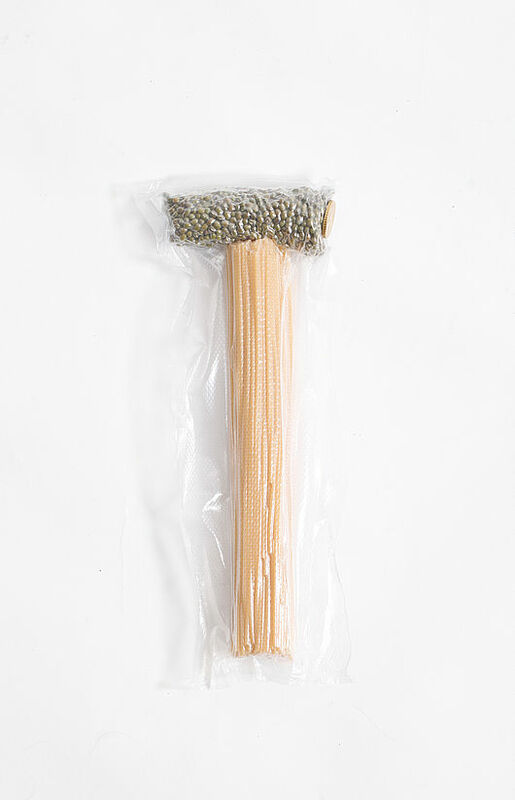 In the designed circle of scho, toothbrush is processed to toothbrush. Opening a water bottle is an everyday activity that you only become aware of when it becomes a problem. Thanks to its handy shape, Hisca (lat. “start opening!”) offers a simple solution due to its powerful leverage. A real relief for anyone who lacks the strength in their hands. The screw cap is material-saving and designed for mass production by injection moulding. As with conventional bottle caps, the Hisca bottle caps are recycled by returning the bottle together with the cap to the deposit system. During the recycling process, the cap material PP/HDPE is separated from the polyethylene terephthalate (PET) of the bottles and can be reused in its pure form for production. The bicycle is one of the most sustainable means of transport. But the way people interact with it and its design sometimes is lavish and material-intensive. My design of a bicycle pedal made of recycled plastic is a response to this: The modest octagonal platform is produced from HDPE (high density polyethylene) utilizing the DIY injection moulding machine by Dave Hakkens and screwed on an axle using only two standard cartridge ball bearings and one nut. All parts can be replaced in minutes without special tools. Therefore, they can be recycled separately. 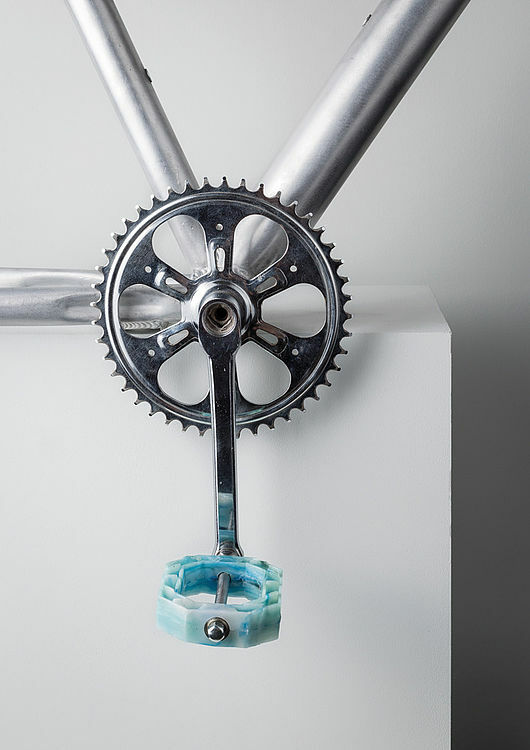 The plans for the pedal will be provided open source – just like the DIY injection moulding machine – and shall empower cyclists to repair and design their bicycles themselves. Production processes often follow straight value chains. This results in unwanted side streams, by-products – mostly waste products. We set ourselves the task of finding extraordinary, surprising, perhaps bizarre, but in any case valuable, industrial waste streams and used them as a starting point – as raw materials for a new material, a new product, a system that works circularly instead of linearly. The project focused on the explorative and experimental examination of diverse materials and their further processing as well as the networking of different industries and processes for the development of sustainable product and business concepts. With the support of external partners, concepts, materials, services and application scenarios for waste materials were developed that cross-link and circulate. In the course of the discussion, manifestos arose which take a clear stand on the subject of sustainability. Our hair is unique and individual. It reveals who we are, stores habits and indicates our age. 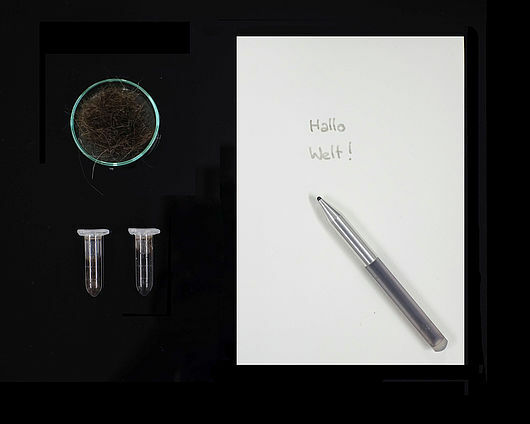 An ink from one’s own hair reveals personal uniqueness to the user and puts the great diversity that exists in hair into a different context – by making it tangible. A signature with this ink reveals more than just the name. It thus verifies itself unmistakably and every handwritten sentence contains a very personal quality. The personal relationship to the ink underlines the gesture of writing. In cooperation with the Institute of Biochemistry of the Martin-Luther-University I have enzymatically dissolved various hairs, obtained pigments from them and then transferred these into ink. Second Skin is a material study that deals with the unused parts of the skin in the tanning industry. Excess skin and its valuable ingredients usually stay unused and are disposed. By chopping and homogenizing the skin sections, a viscous mass is produced. This can be brought into shape by 3D printing or injection moulding. The gluing properties of the skin create a sturdy, bendable material, which can be optimized for various applications with the aid of enzymes. These enzymes such as transglutaminase create cross-links within or between the proteins of the skin – similar to the tanning process of leather. 1.4 trillion eggs are produced annually, according to the Food and Agriculture Organization of the United Nations (FAO). This corresponds to about 1.5 million tons of egg membrane. In the industrial context, the egg shells including membrane are used for cement production, but only the calcium carbonate (lime) of the egg shell is utilized. The glycoprotein egg membrane stays simply burns away. In order to not to lose the valuable membranes, I developed a procedure to separate them from the shells. In the following I illustrate the potential of this material with three possible applications. One deals with shortlife Fashion: The dried membrane not only has an interesting material property for packaging, it also has a special aesthetic. If one covers a surface with it in the wet state, the membranes adhere to each other after they dried and create a kind of nonwoven textile – a textile with a very special symbolism – especially striking for a wedding dress. The concept Baker’s Butchery deals with the integration of a mealworm farm into a bakery, in which the overproduced bakery products get converted into protein. The integration leads to an efficient use of resources, due to multiple uses of infrastructure. 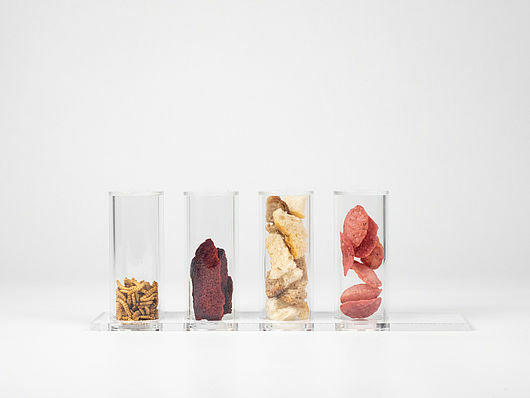 The concept shows possibilities and advantages of a future, in which insects are established as foodstuffs. It should help to question the existing food culture and production, which is a determining factor for global warming and the waste of resources. The Baker Chips are the communication medium and a possibility to approach to insect consumption. 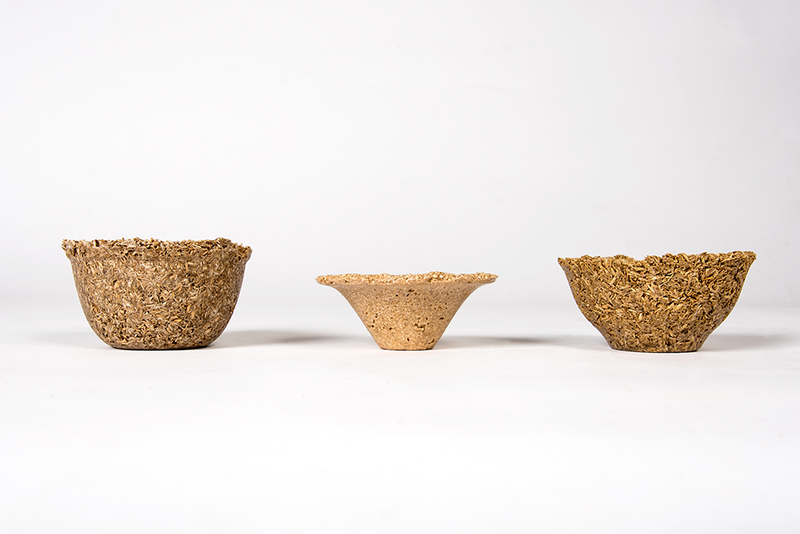 All calculations are based on an existing bakery taken as an example.The “Baker Chips” are the prototype of a new product, that allows consumers to get used to the taste and consumption of mealworms. At the same time, it shows another possibility to convert overproduced bread into a new sustainable product. The chips contain 85% of wheat bread remains, 5% of mealworm flour and 10% of beetroot. The beetroot is responsible for the red color but more importantly for the right moisture ratio to make a processable dough. Throwing away, recycling, or questioning this system? Some products live forever, are even passed on from generation to generation. Others have a short life, are not used a second time, but land in the garbage. Only rarely an equivalent product emerges from them. But is a long life always the better one? Are there applications and situations where disposable products are more sensible, more sustainable and even better than durable products? It was the task to develop deliberately short-life usage concepts, which are still or precisely for this reason sustainable. With external partners, concepts, materials, services and application scenarios were compared and assessed with regard to their sustainability, new conceptions, and sensible scenarios were developed that are surprising – not just because they are designed to be discarded. 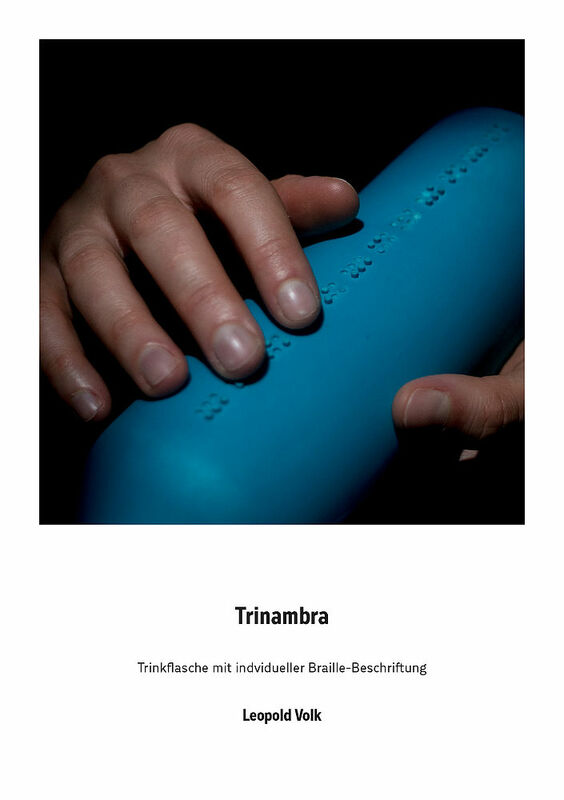 A project at the Burg Giebichenstein University of Art and Design Halle supported by Anja Lapatsch and Karl Schikora. ‘Verblasst’ is a speculative concept that focuses on temporary information within the context of advertising in public space. 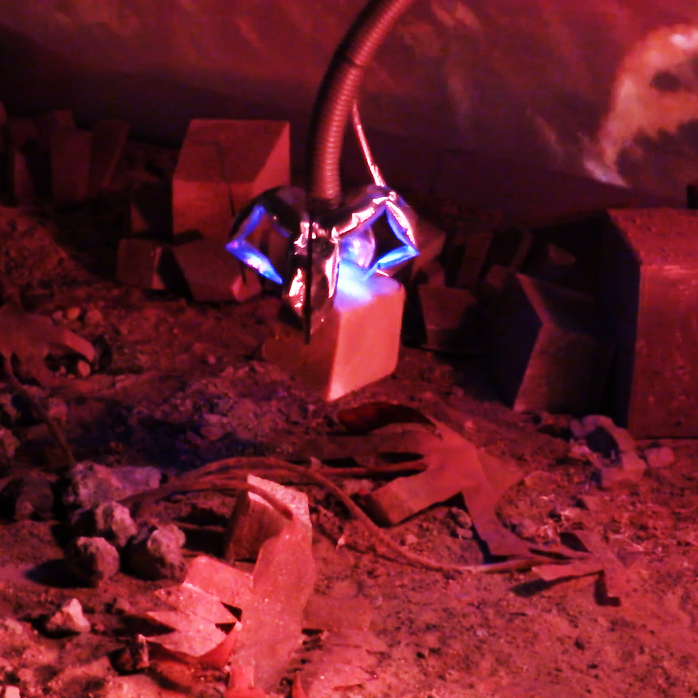 It plays with the idea of generating information with light as medium. At the center of the visualisation, in form of a short videoclip, are surfaces which are coated with photochromic pigments. As a result advertisements and offers can be projected to this surfaces. The exposed spots change their color and after some time the information vanishes. The surface is ready to be exposed again. To formulate our concept we asked two questions. What if the fading could be slowed down and the information vanishes after one day or one week? What if we could adjust the kind of light the pigments are reacting on? The concept of soak features a way to eliminate the effort and the negative environmental effect of printing, by letting the product print itself during the actual time of use. The first idea deals with a children’s plaster: The flowing blood is used to „print“ an image like a dolphin just by using a blind pressed padding. Blood that usually has an unpleasant character is transformed into a positive surprising and thereby cheering effect. The same principle is transferred to a sports shirt: While doing sports the body produces sweat that can be used to „print“ a logo on one’s shirt. This effect not only motivates to sweat more, it is also more sustainable: A combination of two different cellulose fibers allows for this effect. 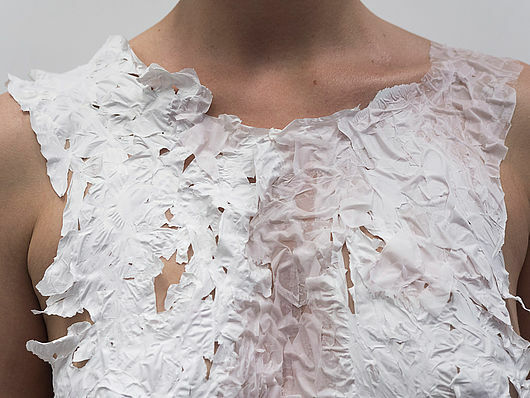 The resulting monomaterial shirt can be easily recycled in comparison to those with prints. Flowers open in the morning with the first rays of sunshine. Fir cones release their fruits as soon as the weather is dry enough. Without a motor and complicated mechanics, shape memory wires deform when they are heated and thus remember their original shape, electroactive foils contract under electric current, piezoceramics generate electricity from vibrations, and coated veneer moves in fog. In exploratory experiments, we got to know some of these materials, interacting with them and learning how to control them. Ultimately, the aim was to bring a self-chosen location at the BURG to life, to create a new kind of interaction that poetically and functionally exploits the creative potential of these smart materials. 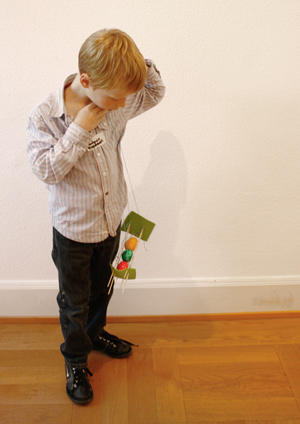 Functional, spatial, material or social-social aspects could be taken as a starting point in order to react sensory, information processing and actuatorially. A coffee to go cup that blossoms and encourages you to pause. A structural problem converted into soap bubbles. A window that reflects your own mood. Burg Giebichenstein Kunsthochschule Halle was represented at Milan Furniture Fair 2018 at the Ventura Future Area. The 13 projects presented there by students of industrial design are investigating the use of biotechnology in design processes. 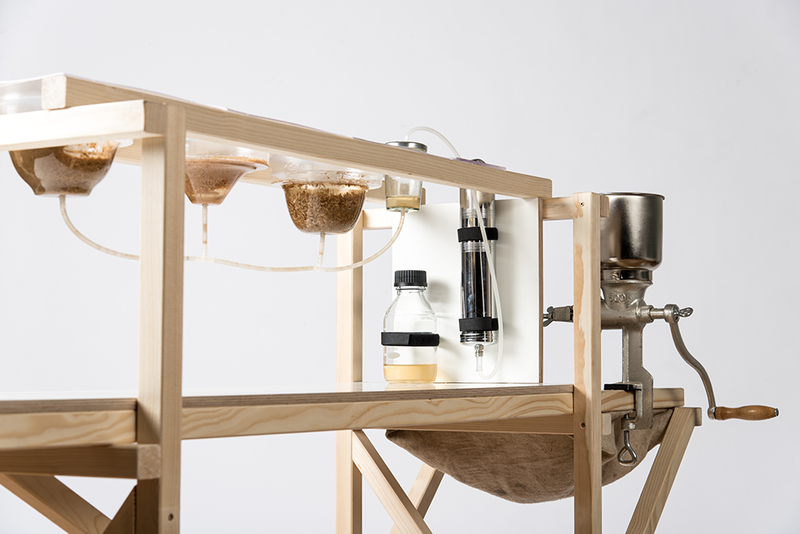 The works developed under the direction of Prof. Mareike Gast highlight ethical aspects when microbes are used in the fabrication of products. 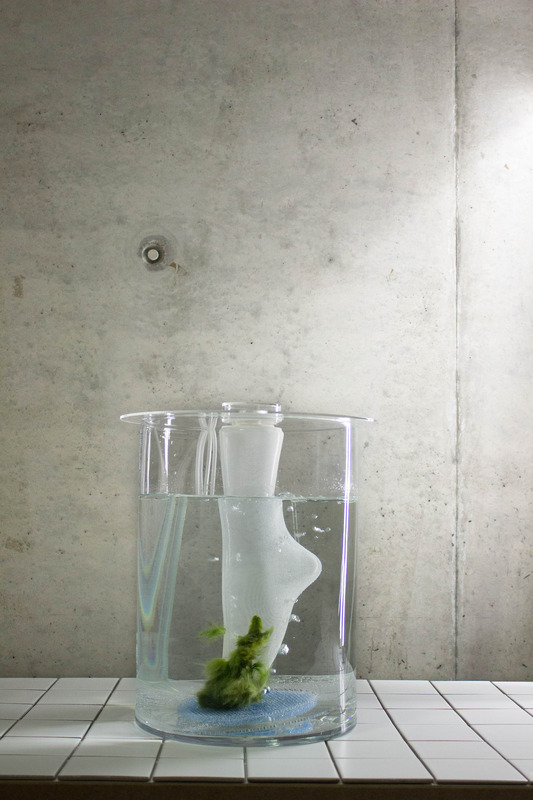 The presented work focuses in particular on algae as a resource of the future and bacteria that produce biominerals. Through close cooperation with researchers and scientists from disciplines such as biochemistry and biotechnology, explorative experiments have been conducted to identify both the potential for future developments and possible dangers. Algae are known as an unpleasant occurrence inside aquariums, as an annoying algae bloom at popular coastal resorts, maybe also as an integral part of nutrition in some cultures, but still they are an almost unused resource – despite their incredible variety and their ability to grow much faster than land plants without competing with other foodstuff. Some algae even bind heavy metals, others can provide important minerals or biofuels, or even produce tailor-made plastics from carbon dioxide in the air with solar energy. The second microbes project dealt with the question: how can we make use of this valuable raw material and not only substitute materials and products with algae but create new applications, qualities, characteristics and usage scenarios? In order to explore this question and provide innovative answers, exploratory experiments were performed alongside intensive discussions with various experts. Algae grow up to 40 times faster than rooted plants. All they need is light, water and nutrients. Due to the rapid spread, they are often regarded as a plague. Starting from these properties, the present study deals specifically with the growth and utilization of fibrous algae to be transferred in textile contexts. These are processed by means of newly interpreted technologies into semi-manufactured products, up to the finished grown product. 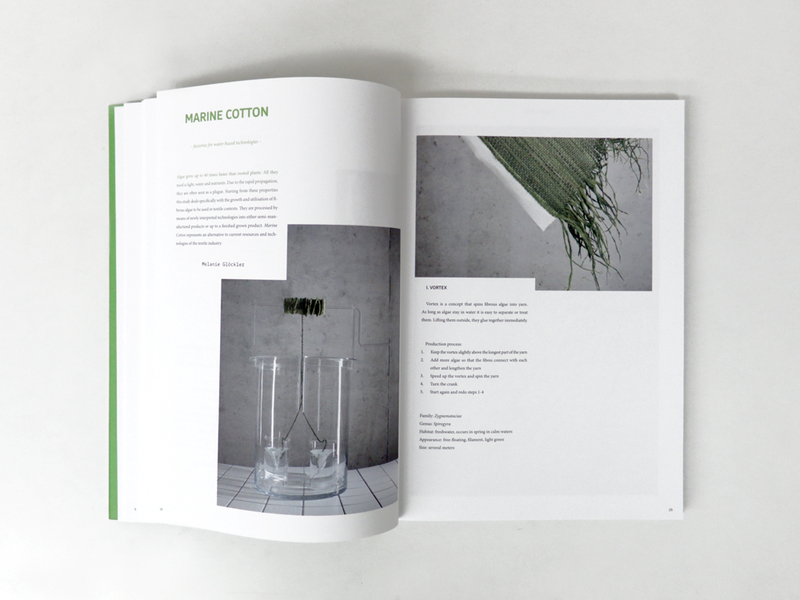 Marine Cotton represents a new alternative to already known resources and technologies of the textile industry. Stocks of various microalgae are available in your pantry - differing in species, metabolic by-products, growth rate, appearance. 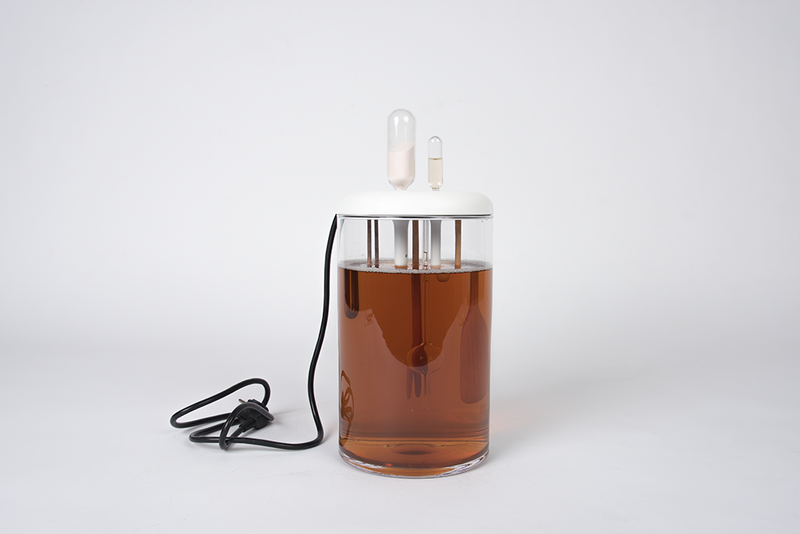 Choose the right algae culture for your personal requirements. Three different plates are providing three different growing conditions that are resulting in three different dishes. 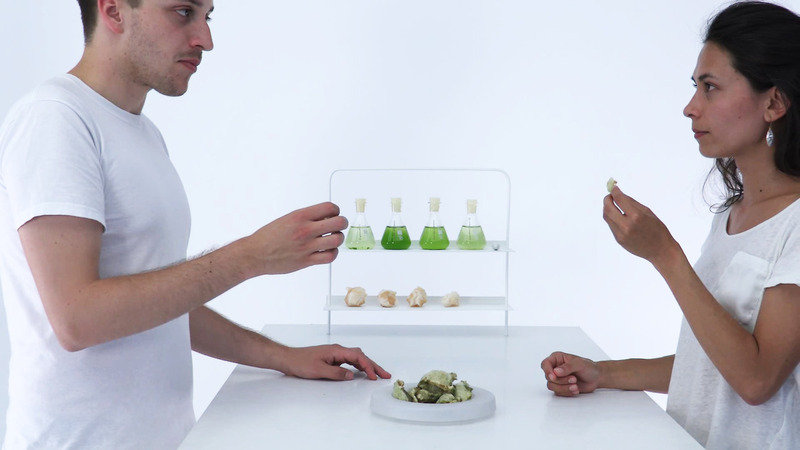 Take the appropriate plate and inject your algae culture. Put over the cultivation chamber to create the ideal growth environment. Spit and breathe - feed your culture with a daily dose of bodily nutrient and air supply. During ten to fourteen days you raise the seedlings to a lush population. Take off the chamber and consume your dish. Negative connoted byproducts of the human body are containing a range of usable substances. Simple organisms, like micro-greens are able to use them. In combination with light, spit and breath all conditions for microbial growth are given. A kind of symbiotic relationship is emerging. Micro-algae can be found in different organisms where they live inside and are an important part of their host. Often they offer their “partner-algae” an safe habitat and get remunerated by nutrients and other products of the photosyntheses. In this project I developed three futuristic concepts how our future with an algae symbiosis would look like, how it would affect our everyday life and which abilities we would get. My starting point was a research into already existing symbiosis between different animals and micro-algae, which I transferred to the humans’ life. The results are not only new practical abilities, but also the question of how we define a “healthy” habitat for ourself and our farm animals. 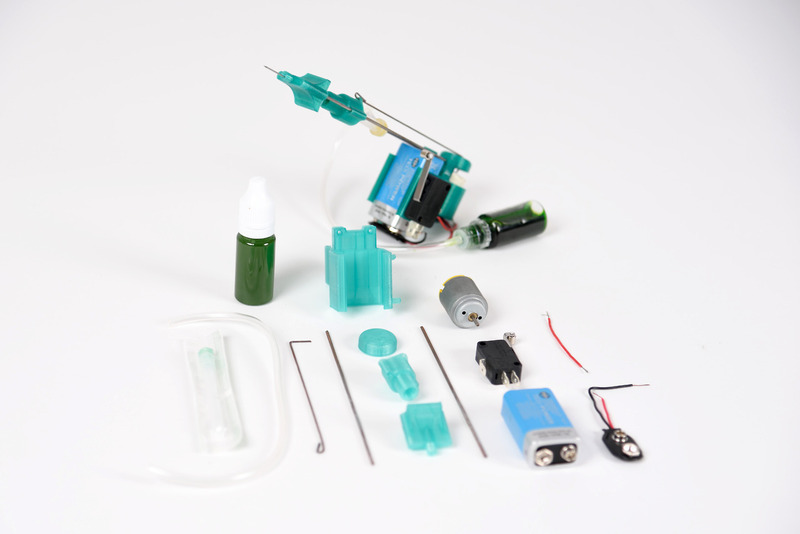 Here a tattooing device to inject micro algae under the skin in order to give people photosynthetic properties. The drinking bottle - a valuable travel companion on short and long distances. In which situations are drinking bottles used? When cycling, sunbathing, while doing sports, while working or climbing? How are bottles worn and held? How is their handling with sticky or slippery fingers? How do they fit into small or large hands? How are they refilled and how do they fit into a full bag? The focus was placed on the material plastic and the production of hollow forms by rotation moulding. 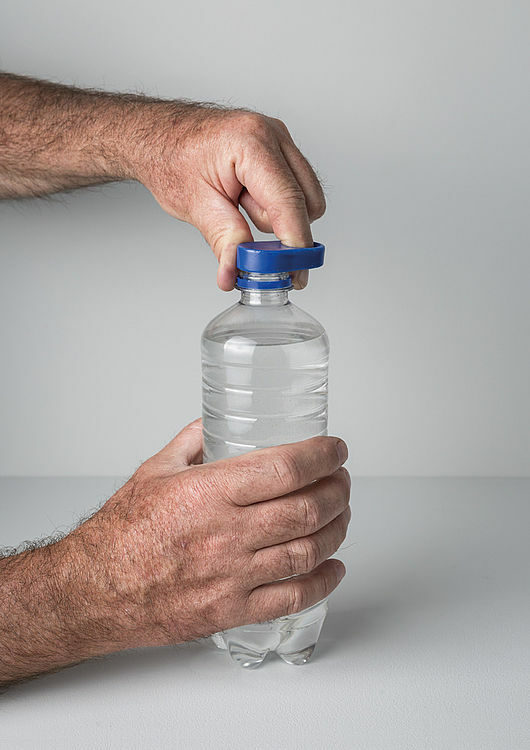 The prototypically realized bottles were designed for special situation. All relevant functions were integrated into the material, surface and geometry – rather than added. 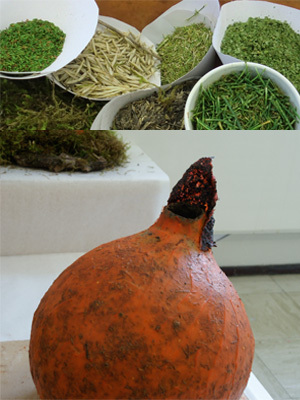 The two-week project Foaming Parasites dealt with the foaming of different materials and their functional adherence to suitable surfaces and objects. The students experimented with the special properties of different foaming processes and developed lightweight, functional and aesthetic add-ons. Based on the developed parasitic concepts, they designed and realized foaming devices with voluminous effects. The first project is focused on biomineralisation, meaning organisms that are able to create minerals. The main difference and also advantage of biomineralisation, in comparison to the geological and technical way of producing minerals, is that neither high temperature nor pressure are necessary. Also, biominerals grow into well-defined structures and composites with extreme properties. On the other hand, completely new challenges arise from working with living organisms and the concept of growth. 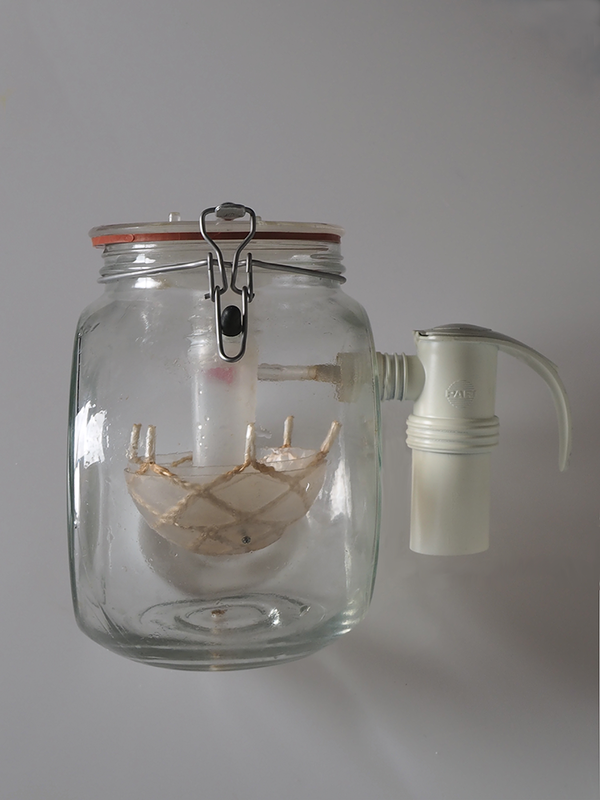 We conducted explorative experiments with the bacterium Bacillus pasteurii, which produces calcium carbonate, to answer questions such as: How can we make use of their adaptability, resilience, and their fast reproduction? Which processes and products can be realized at the present time? What consequences will microbial production have on consumer-interaction in the future? Porifera Mollusca combines the most significant characteristics of shellfish and sponges and creates synthetic nacre – a biomineral, consisting to about 95% out of calcium carbonate. Porifera Mollusca is an effort to create a process, in which structural and aesthetically valuable nacre is produced by bacteria, in any volume or shape. 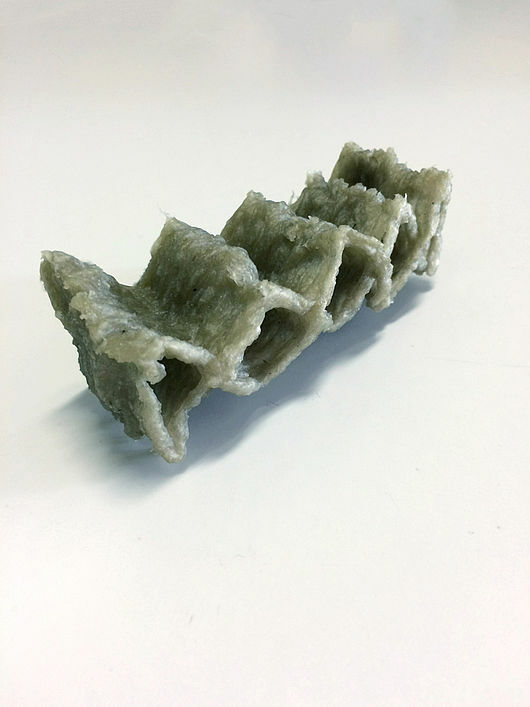 The synthetic nacre produced here covers fiber and porous sponge structures resulting in lightweight, strong and graceful materials, that are compostable but still resistent to natural influences. Chaff is a common leftover all over the world – from rice, from corn, from millet and other crops. Their often high content of silicon dioxide offers the possibility to turn them into fibre reinforced cement by biomineralisation in combination with calcium carbonate. The resulting material is different in different location depending on the kind of chaff, but the process is the same. We developed a simple and mobile tool that demonstrates the process and that makes it available to almost anybody. We eat genetic modified food, containing less nutrients than the original forms. On the other hand we drink drinks enriched with minerals and vitamins. In case of suffering from deficiency symptoms, we take pills to adjust our vitamin and nutrient household. Are there better ways of nutrient supply and health care? 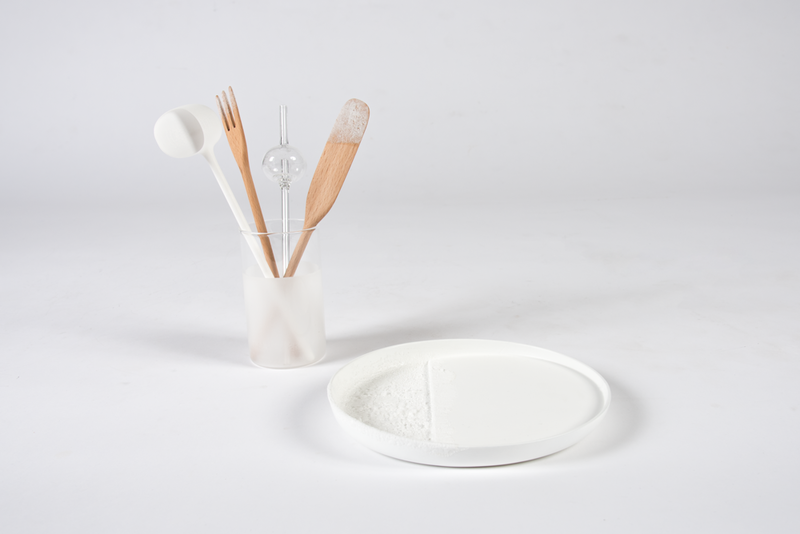 The object family subliminals shows a prospektive alternative to common nutrient supply by pills or other medicines in a future of nutrient-poor food. 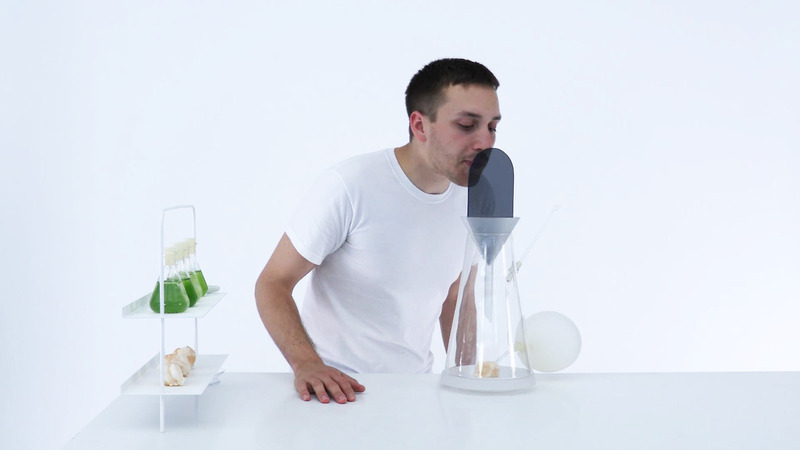 The objects are satisfying your daily requirement of minerals – produced by bacteria. Ingesting nutrients in a new incidental way constantly, but also controllable and visible. 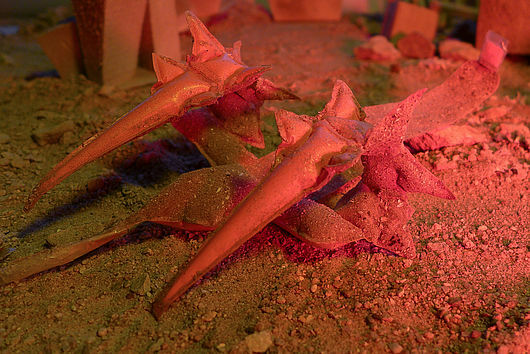 The dosing of the different minerals is controlled by the objects themselves and their sizes of coated surfaces. Künstliche Bewegungen können mit Elektromotoren und starren Materialien erfolgen – oder aber einfach aus Luft bestehen und dadurch weich, adaptiv, nachgiebig und sehr günstig sein. 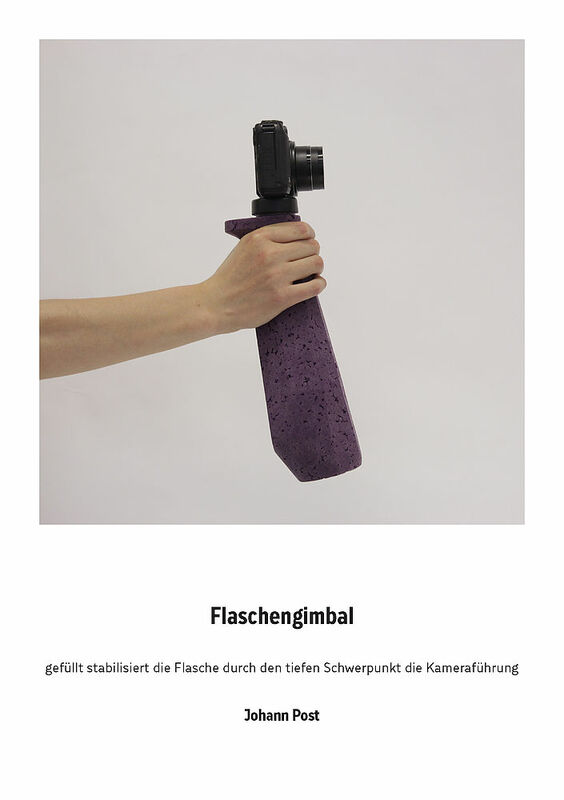 Wir setzten uns mit dem recht jungen Forschungsfeld der Soft Robotics auseinander und entwickelten aus selbst hergestellten Folienkissen ultraleichte Objekte, die nur durch Luftdruck vielfältige und komplexe Bewegungen vollführen. Im Experiment loteten die Studierenden die besonderen Eigenschaften dieser künstlichen Muskeln hinsichtlich Leichtigkeit, Bewegung und Ästhetik aus. Basierend auf den erarbeiteten Bewegungsformen entwarfen sie schlussendlich Figuren für ein von Ihnen konzipiertes, gestaltetes und inszeniertes Luft-Schauspiel, dessen Aufführung das Finale der Fachaufgabe darstellte. Phänomenale Dinge geschehen – manchmal außerhalb unserer bewussten Wahrnehmung: Papier wellt sich durch Luftfeuchtigkeit. Ameisen orientieren sich durch Schwarmintelligenz – Kröten am Erdmagnetfeld. Bakterien produzieren Gestein in beeindruckenden Formationen. 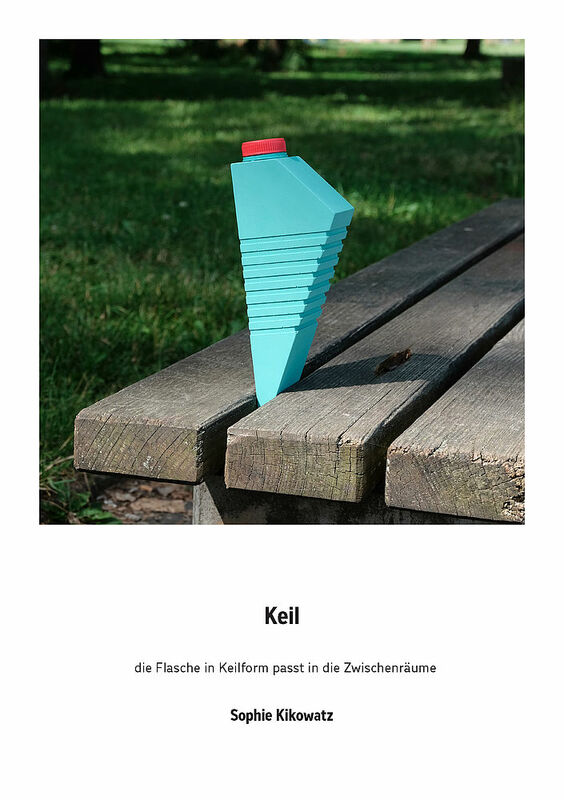 Gallwespen manipulieren Bäume, so dass diese statt Blättern gallenartige Häuser für ihre Larven wachsen lassen. In einigen Gegenden ist es einfacher Coca Cola zu bekommen als sauberes Trinkwasser. Ziel des Kurses war es, besonders herausragende Phänomene – natürliche und andere – zu beobachten, sie sich bewusst zu machen und in Apparate zu überführen, um die Phänomene anwendbar, greifbar, steuerbar und vor allem nutzbar zu machen. Die Herausforderung bestand im Besonderen darin, die durch Einfachheit bestechenden Phänomene in ebenso einfache aber verblüffende und überzeugende Apparate zu übertragen, um so komplexe Objekte oder Prozesse phänomenal einfach umzusetzen. Nach einem theoretischen Einblick in verschiedene industrielle Biokunststoffe und Komposittechnologien kochten die Studierenden mit "Haushaltsmitteln" eigene Biokunststoffe. In Kombination mit Naturfasern stellten sie daraus minimal leichte aber maximal hohe Objekte zum Erklimmen von ungeahnten Höhen her. Das Experiment ist Prinzip. Im Versuch mit unterschiedlichen Rezepturen und Strukturen loteten sie die besonderen Eigenschaften von Kompositen hinsichtlich Leichtigkeit, Konstruktion und Ä̈sthetik aus. Durch Verarbeitungstechniken aus der Mode erhielten die Biokomposite eine unerwartete Anmutung. Begleitend recherchierten die Studierenden einen industriellen Komposit-Herstellungsprozess im Detail. Am Ende der zwei Wochen wurden die minimal weight – maximum height-Objekte auf Stabilität und Höhe getestet. 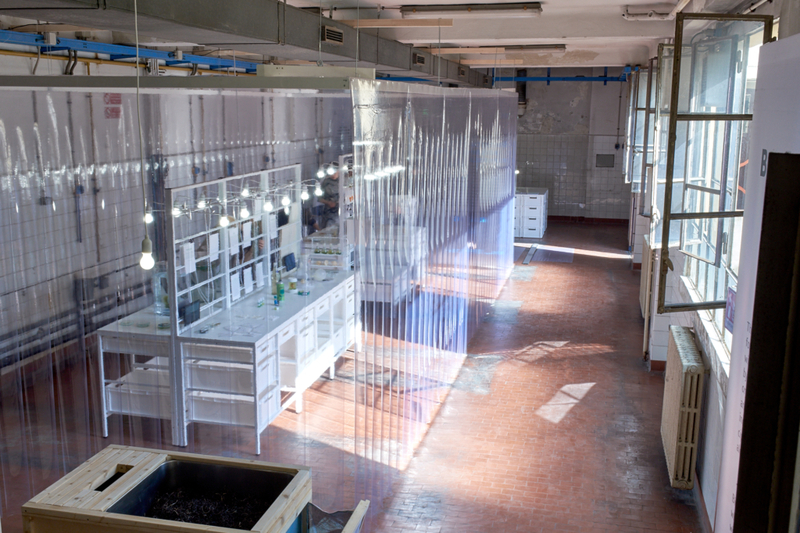 The biotechnological area has begun – what do we make of it? Mikrobielle Zellfabriken sind bereits jetzt im Einsatz: Cyanobakterien wandeln dank DNA- Bausteinen der arktischen Makrele Kohlendioxid aus der Luft und Wasser in Biokunststoffe um – einzig mit der Energie der Son- ne. Genetisch veränderte Hefe produziert Vanillegeschmack, andere natur-identischen Rosenduft. Weitere Mikroorganismen stellen mittels natürlicher Stoffwechselprozesse Ethanol-Treibstoff her. Dank der synthetischen Biologie, die über das Züchten und Kreuzen hinaus DNA gezielt verändert, wächst die Vielfalt der Möglichkeiten rasant: Maßgeschneiderte Proteinmaschinen in Bakterien, Algen, Pflanzen als auch Tieren und Menschen produzieren maßgeschneiderte Materialien, Strukturen und Funktionen. Wie verändert die Biotechnologie – die Schlüsseltechnologie des 21. Jahrhunderts – den Gestaltungs- und Produktionsprozess? Wie sieht die Tätigkeit des Industrie- designers aus, wenn er mit DNA- Bausteinen statt CAD-Daten arbeitet? Welche völlig neuen Produkte und Anwendungen begegnen zukünftigen Herausforderungen? Ziel des Kurses war es, nach intensiven Workshops und Gesprächen mit Biotechnologen sowie selbständiger Recherche realistische wie zukunftsfähige Produkt-, Produktions- und Anwendungskonzepte für das Jahr 2084 zu entwickeln, die die Potentiale der Biotechnologie aufgreifen, kritisch beleuchten und in konkrete Szenarien überführen. Diese sind hier dargestellt und stellen Ihnen bewusst die Frage: Was wäre, wenn....? Wir freuen uns auf eine intensive Diskussion und Ihre Reaktionen. 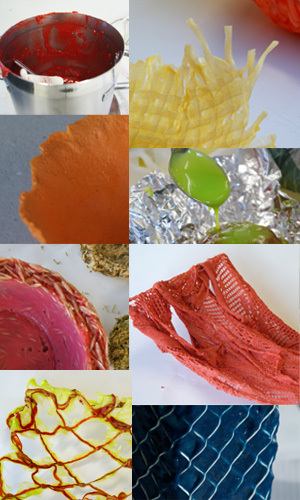 experimental workshop using selfmade bioplastic + natural fibers within the project "Postcarbon: Design für eine zukunftsfähige Lausitz"
During the two-weeks experimental workshop the students gained an insight in the potentials of bio-composites. 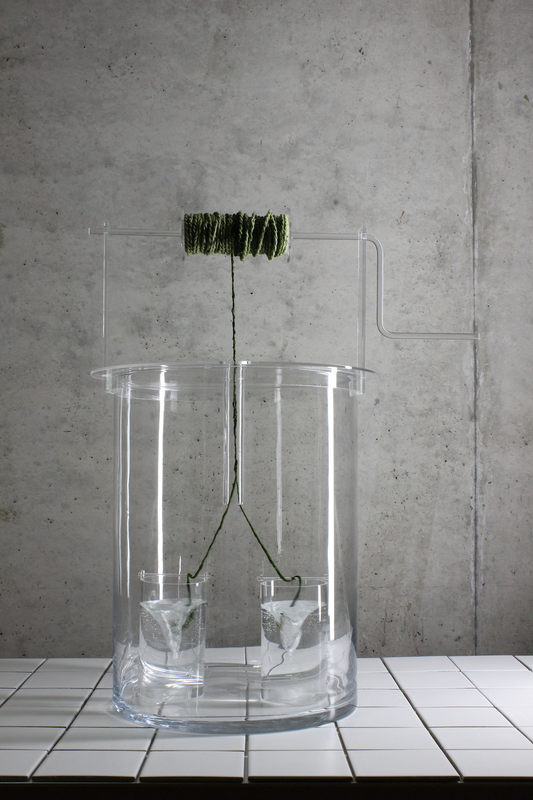 They created extremely lightweight stools by weaving, knitting, braiding, crocheting and folding natural textiles, yarns or fibers and coating them with self-made bioplastic. 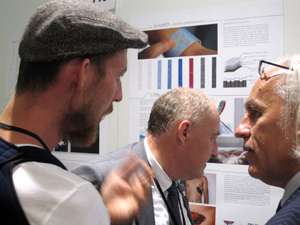 The results were presented on the conference "Printing Future Days" and published in the accompanying book "Printed Electronics meet Design". 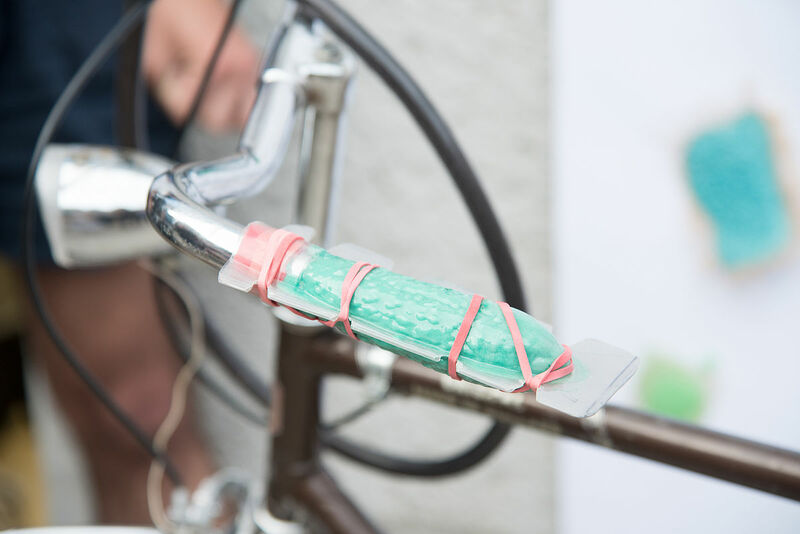 Project N'RUN by Jennifer Neumann and Benjamin Appel – almost immaterial sport devices for runners. 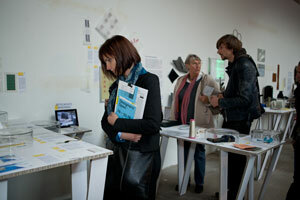 Project VISIBLIZER by Jennifer Salize and Nora Fischer – an interative city guide giving the user views behind facades. During the two-weeks experimental workshop the students gained an insight in the potentials of bio-composites. They created extremely lightweight stools by weaving, knitting, braiding, crocheting and folding natural textiles, yarns or fibers and coating them with self-made bioplastic..
Organic electronics, being one of the most promising fields in material and technology research, are especially interesting for industrial designers since their new possibilities will not just change the products but also their handling, interaction and service completely. In Saxony and Saxony-Anhalt, where Halle is located, great research activities in the field of organic electronics are taking place. 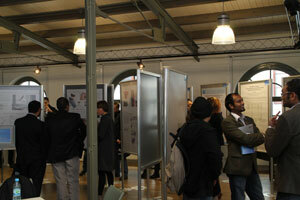 Visiting several companies and institutes around Halle was the starting point of this project. Having gained an insight in the current developments but also in the developments to be expected within the next years, the students were asked to develop and design ultra-lightweight, energy-autarkic, mobile and forward-looking products which make use of printed, organic electronics in their broadest sense. Hereby questions arose, like: Does a cheap technology like printing necessarily produce cheap disposables or how do printed high-end products look like? Can a flexible substrate like paper or foil with organic electronics be shaped with traditional methods and what is the result of that contrast? How does the user interact with flexible electronics? 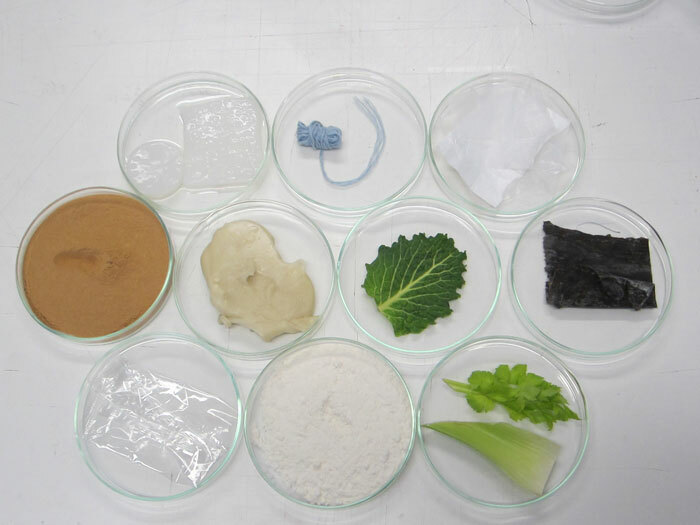 What if printed organic electronics are recyclable or bio-degradable? How do products function and look like that are custom-printed? "Adaptable, Elastic, Resilient – printed electronics for future displays – a workshop"
Speed Talk about: "Design meets Science – Creating Visions Together for Tomorrow"
For the very first time a dedicated session "Printing Future Days Design" was held during which students from the Bauhaus University Weimar, Academy of Visual Arts Frankfurt/Main, and Dresden University presented a joint approach to new product ideas for „Printed Electronics“. 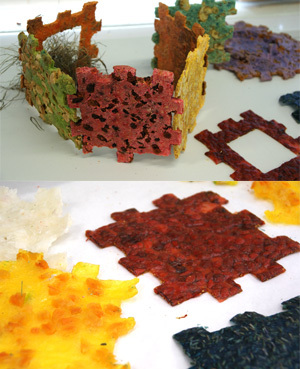 talk: "Future Visions with New Materials and Technologies from a Designer‘s Perspective"